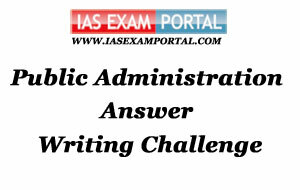 Weekly Mains Exam 2016 Answer Writing Challenge - Public Administration "MODULE- 39" | IAS EXAM PORTAL - India's Largest Community for UPSC Exam Aspirants. Weekly Mains Exam 2016 Answer Writing Challenge - Public Administration "MODULE- 39"
Q1. Judicial activism connotes the assertive role played by the judiciary to force the other organs of the state to discharge their duties. Comment. 20 Marks. Q2. Lokpal is the counterpart to the north European institution of Ombudsman. Discuss. 20 Marks.